Minor tempo tweaks can make a big difference. Though it's generally fine for most genres of dance music, whose inherent metronomic character tends to demand it, the rigidity imposed by a DAW's default fixed tempo and timing grid isn't to everyone's taste. The temptation of the mathematically perfect timing offered by our machines makes it all too easy to fall into the trap of choosing a single tempo and time signature and sticking rigidly to it for the entirety of the track. This tends to iron out any semblance of the feel that you'd get if the track was played by a roomful of musicians, and you end up missing the natural push and pull that occurs when humans get together and play a song. It's an effect that tends to work best with "real" instrument sounds - be they recorded or virtual - but it can absolutely apply to electronic compositions too, of course. Playing around with your DAW's project tempo can have a profound effect on how a piece is perceived by your listeners. Even if the parts are still rigidly quantised to the grid, a tiny increase in tempo as you dive into the chorus can do a lot to emulate the natural heightening of excitement experienced by a band doing the same thing. Although it's best to make this a part of your composition process, it's thoroughly possible to apply it to your tracks late in the game, even if they use audio parts, thanks to the modern DAW's ability to timestretch on the fly. Here we'll show you how to do exactly that. For more organic music production tutorials and techniques, pick up Computer Music 224, which is on sale now. Step 1: When altering the global tempo of a project that contains both MIDI and audio, you need to make sure your DAW is set to allow audio files to follow fluctuations in tempo. Before you make any tempo changes, any audio tracks or regions need to be analysed. Each DAW has its own method for doing this - we'll be using Logic's Flex Time system. Step 2: Here's a Logic project featuring a Drummer track, a MIDI bass part, a tambourine part from the Apple Loops library, and an acoustic guitar track made of samples. 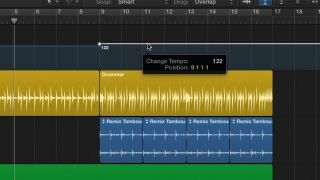 The Apple Loops tambourine will follow tempo changes automatically, since Apple Loops contain metadata that allows them to conform to the project tempo. The Drummer track and the MIDI track always follow the tempo anyway. Step 3: The acoustic guitar samples, though, need to be analysed before tempo changes can be applied, particularly as they're four-bar loops and so with even a tiny tempo shift would be noticeably out of sync as they approach the final bar. So we enable Flex mode for the guitar track with the Flex icon in the track header, selecting the appropriate mode from the menu - Polyphonic. Step 4: Once all the necessary tracks have been analysed, we can start making global tempo changes. To do this, we need to access the global tempo track, which should look a bit like an automation lane, but for tempo instead of parameter changes. In Logic's case, it's conjured up by clicking the Show/Hide Global Tracks button in the track header list. Step 5: Many tracks feature a chorus that's a little quicker than the verse, raising excitement and drive. We'll speed up the track at the transition between sections at bar 9. To make a change in tempo at this point, double-click the tempo curve to create a node. Click-hold on the curve before and after the point and move the cursor up or down to select the required values. We're going from 120 to 122bpm. Step 6: As we play through the transition, the tempo now changes on the downbeat of bar 9, and all tracks keep pace. To get an even more human feel, we can use the same technique to input slight variations of 1-2 bpm every other bar, maintaining a quicker average tempo in the chorus. Other tempo tricks include varying the tempo for bars that contain fills or that lie just before a new section.